The vast amount of genome-wide polymorphism data available has led to, considerable efforts to develop methods to detect natural selection at, the molecular level. Finding regions under selection is one of the, first steps towards understanding the processes of adaptation and, speciation. Our ability to detect selection depends critically on the, data available and on the robustness of the methods to the underlying, assumptions. Several commonly used methods look for FST outlier loci. However, these methods sometimes fail to identify loci under weak, selection. Conversely, some neutral markers can be inferred to be, under selection. Alternatively, we can use haplotype-based methods to, infer selection within populations. These methods rely on the idea, that positive selection on a position in the genome will create a, region of extended homozygosity. We study here the efficiency of three, such methods (iHS, nSL and H12) in simulated data obtained by, performing artificial selection on a polygenic trait. We show that, these methods work mainly when selection is strong and the traits are, only mildly polygenic. 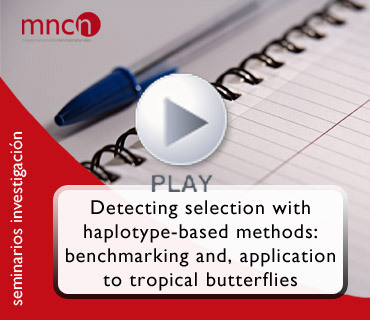 Furthermore, we analyse sets of individuals of, the tropical butterflies Heliconius of different species and morphs, to test the power of these methods on known regions under selection, and to infer new candidates of selection. Presentación: Marta Barluenga, Departamento de Biodiversidad y Biología Evolutiva, MNCN-CSIC. Ponente: Dra. Ángeles de Cara, Museo de Historia Natural de París, Francia.